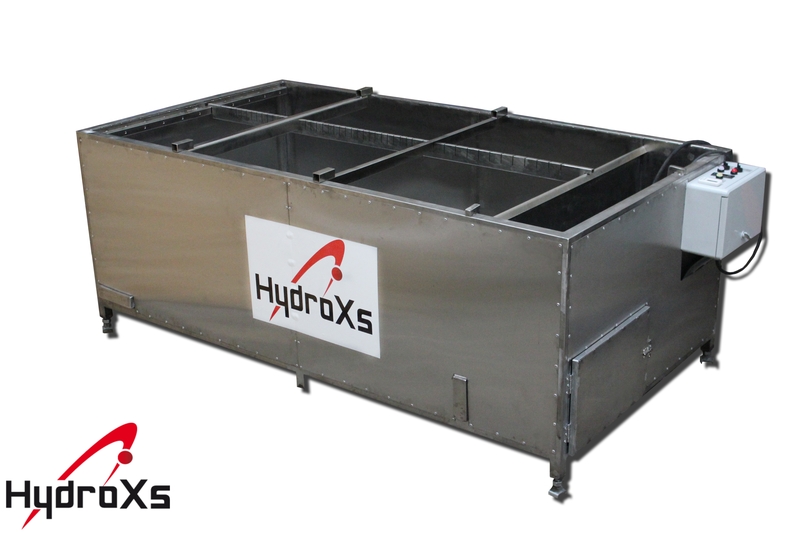 HydroXs is a modern and innovative line of hydrographics tanks made of high-quality stainless steel 304. Heating elements placed in a small section, away from the area of the working section, in order to get rid of the bubbles produced by the heater. Water circulation between two sections is fully automated. Its proper functioning is controlled by a thermostat with a microprocessor integrated with an electronic thermometer equipped with two probes measuring the temperature of the water in two sections of the device. The water temperature is controlled , and based on this reading the electronic thermostat manages the work of the heaters, the pump and the solenoid valves controlling water flow between the sections of the device. 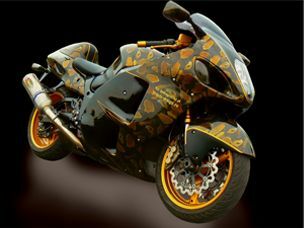 Circulation of the heated water does not influence the performance of the hydrographics process, thus it is possible to work without stopping. In some devices water flow goes through the spray bar into the large dipping section . 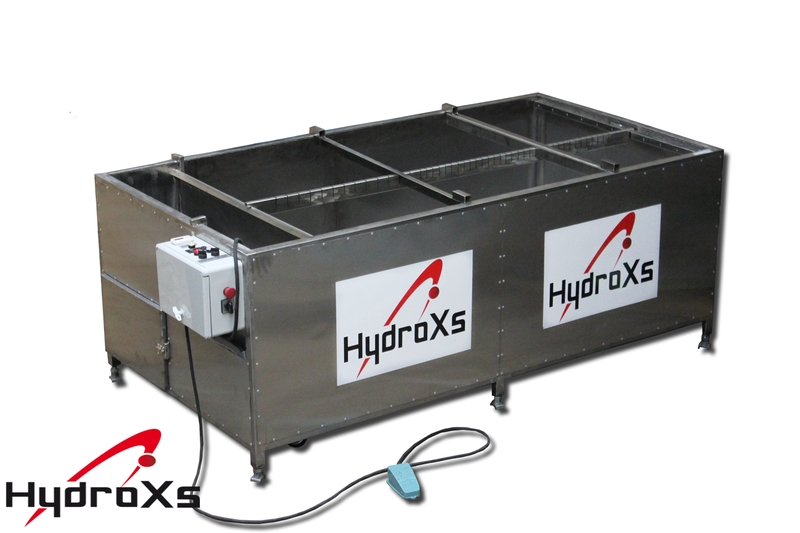 It is a problematic solution, because the sprayer bar must work continuously, and to perform the hydrographics process the circulation of heated water must be switched off. 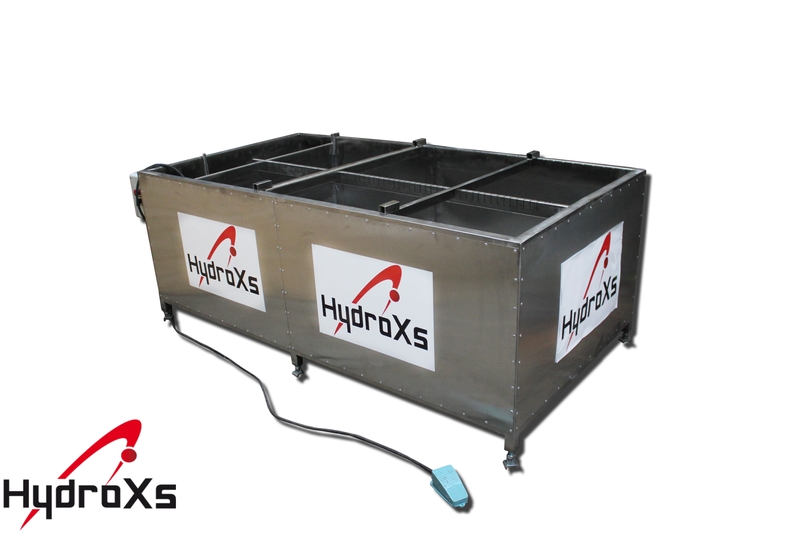 In HydroXs devices the above problem has been solved. 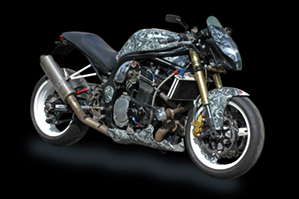 Water circulation is fully automated and goes through special pipes, allowing for the continuous performance of the hydrographics process. 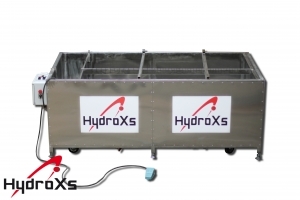 The device has also been equipped with a foot pedal which switches on the water surface filter. It is a very useful function; when our hands are busy holding an object, we can start the water surface filter using the foot switch. 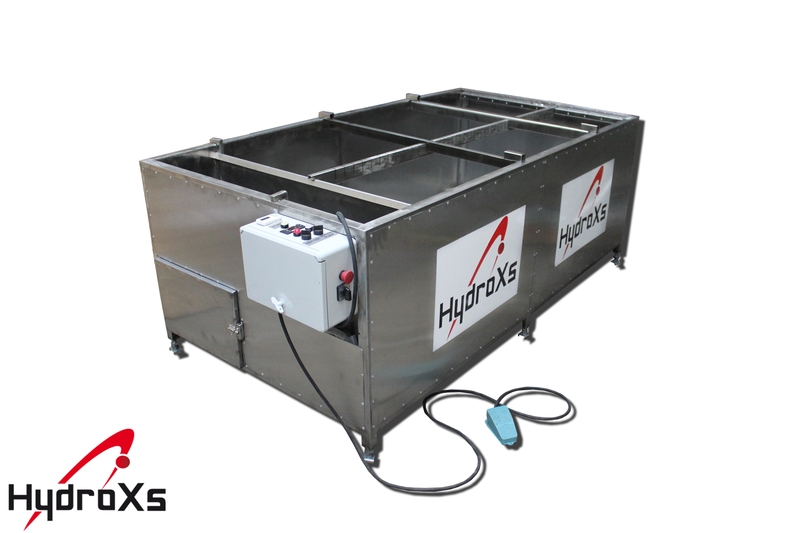 To ensure low exploitation costs the walls of the device have been insulated and covered with an additional metal sheet made of stainless steel 304 minimising heat loss. 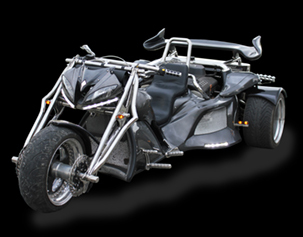 Additionally, it is possible to install a thermally insulated cover covering the top of the tank. 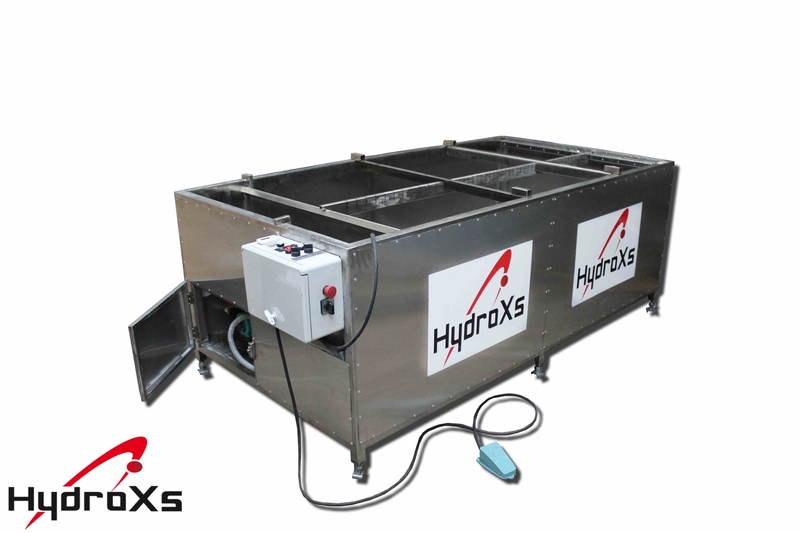 EXTERNAL HEATERS – heaters placed away from the working section of the tank and electronic control of water flow coupled with an electronic thermostat with two sensors in order to prevent the emergence of bubbles in the working section during water heating. AUTOMATIC VALVES – all functions of water flow are operated automatically and from the control panel, without the use of manual valves. FOOT PEDAL – when your hands are busy holding a submerged object after the hydrographic process has been completed, and when you want to clear the water surface before taking the object out, you can start the filter using the foot pedal. INSULATION OF WALLS - in order to obtain the working temperature quickly and to save energy.